For those of you that have been keeping up with my stream, you’ll know that I’ve been incredibly excited for Super Mario Maker. I believe it has the potential to have a great community of both level creators and players. 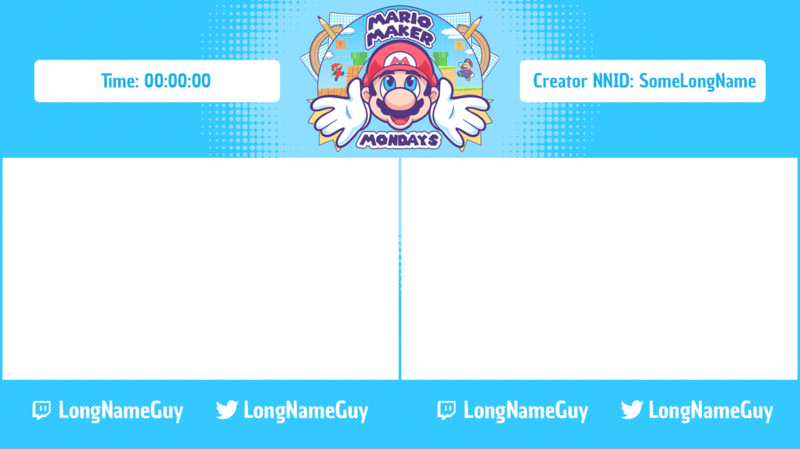 I want to be involved with the community upon release and that is why I’m pleased to announce my newest project Mario Maker Mondays. The goal of Mario Maker Mondays is to bring together both gamers who are talented at level design as well as players who love tackling challenging levels. By creating a weekly event where both can be spotlighted, I believe this will be an exciting way to grow the Super Mario Maker Community here on Twitch. Every Monday starting on the 21st of September at 9 PM EST, I will be hosting a Super Mario Maker race that will consist of a pack of Six to Eight levels that will be submitted by different level designers within the Super Mario Maker and SpeedRunsLive.com communities. These levels will be handpicked by me and will not be revealed to the public until the race starts. The race will be open to anyone that is interested and will use SpeedRunsLive’s IRC race function. There will be no waivers, no things to sign. All you need to participate is an account set up on SpeedRunsLive.com. You can find out how to create an account HERE. Each weekly race will be hosted on my channel twitch.tv/iateyourpie where I will be giving commentary alongside special guest commentators each week! Every two months after 8 Races there will be a 16 Person Single Elimination Bracket that will be seeded based on the points that were gained throughout the 5-6 races. This tournament will take place over the course of one day, and will also all be streamed on my channel. Each match up will consist of completely new levels so there will be no advantage to those who race last. That means each tournament will have at least 20 unique levels. At the end of each tournament we will crown a Super Mario Maker Champion. The race layout will include information regarding the racers such as their Twitch and Twitter to help promote them. There will also be stream space that will highlight the level designers so that the content creators can get their name out and people can look up some of their other Mario Maker Creations. As I’ve stated earlier, I want this to be an event that rewards both racers and creators, which is why there will be a bonus prize incentive for level creators. Each week after the race has finished, all six levels will be open to the public to try and play.Voting for each round will consist of Mario Maker's Star System. Once you've played the level and you want to vote for that level, simply give it a star. Each week, the level with the most stars will be chosen to move to the final round! These levels will be voted by those who have played them and the winning level will move on to a final round that will feature a finalist from each week, including the tournament. There will then be one final poll between these finalists where the level with the most votes will receive the $100 Nintendo E-Shop prize. The goal of these events is to not only grow the community of Super Mario Maker, but also to get more people racing. Racing has been one of my favorite hobbies while I’ve been a part of the speedrunning community, and I believe bringing in a new audience through the release of Super Mario Maker will be a huge step towards getting more people interested in racing! This is also a great chance to spotlight people who will be creating great levels through Super Mario Maker. This is an event will bring together streamers, racers, and content creators, so I’m excited to see what levels people submit, and how the event unfolds! If you're interested in possibly doing commentary or restreaming shoot me an email at iateyourpieSR@gmail.com.